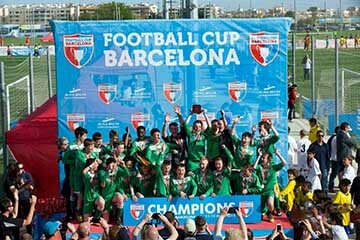 Football Cup Barcelona is an international youth football tournament for boys and girls, held in Salou and Cambrils area in the south of Barcelona. A high-quality football tournament designed to provide unforgettable days of football and fun – on and off the field. The tournament will be played at a fantastic football venue with 8 full-size fields – four high-quality natural grass (two hybrid fields) and four latest generation artificial grass fields. A perfect combination of football and holidays – two days full of matches, first class football venue, a visit to the Camp Nou stadium and to the Port Aventura theme park. Around 100 teams from 15 countries participate in April and around 80 teams from 15 countries in October tournament.